I’d never eaten Ethiopian food and so was looking forward to checking out Abyssinia Cafe & Restaurant in Harehills, Leeds. Abyssinia doesn’t have a website and so the only information we had about the place came from three very positive reviews on Trip Advisor. We weren’t even sure the restaurant was still open, and so were relieved to see the lights on and a couple of guys drinking coffee inside, when we pulled up on Ashley Road. To make the visit even more interesting the friendly proprietor of this modest restaurant told us that he didn’t yet have any printed menus, and so we had no idea what to order. 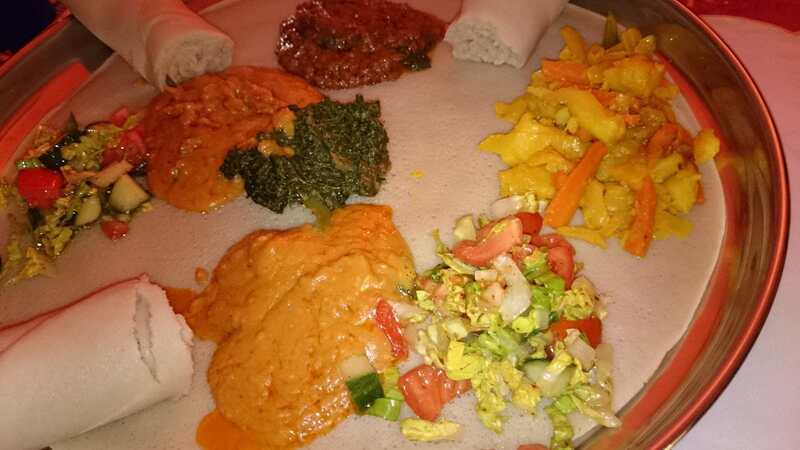 Ordering as a vegan can be pretty risky at the best of times, especially when there’s a language barrier, but the owner seemed to understand that we didn’t eat meat, eggs or dairy and headed to the kitchen to prepare us a traditional Ethiopian meal. A bit of Googling when we took a table reassured us that a lot of Ethiopian food is vegan. After a short wait the proprietor reappeared with a huge platter containing bread topped with various sauces and salads. The dish looked really nice and I eagerly tore off pieces of bread to scoop up the vegetables and pulses. Cutlery isn’t used when eating Ethiopian cuisine and so this was a fingers-only affair. There were several different kinds of dips, all served on top of a huge circular bread and accompanied by even more bread in the form of rolls. From what we could work out by talking to the owner, the dips were variously made from red lentils, cabbage, and spinach, with a salad that was incredibly hot and spicy. I’m a real fan of spicy food but for some reason hadn’t been expecting Ethiopian food to be spicy, so the heat of the dish was a welcome surprise. The owner told us that one of the dips (the yellowish one in the photo below) is called shiro, and is made from chickpeas. It was served sizzling in a small pot. I really enjoyed sampling the various dips, which were all full of flavour, fresh, and as I just mentioned, very well spiced. Ethiopian bread is called injera. It’s a sourdough-risen flatbread with a soft and spongey texture and made from just teff flour, water, and salt. We were served with a huge amount of it – as well as the circular bread on which the dips were served, we had three rolls of injera on the platter and another two rolls on a side plate. I’d say the bread is an acquired taste. My partner wasn’t so keen on the sour flavour, and whilst I liked the sourness, I wasn’t a huge fan of its spongey texture. If you like soft bread though (imagine a much thicker version of the bread used in wraps), you’ll probably really like injera. We were completely full by the end of the meal but when ordering had forgotten to ask how much it would cost. As Abyssinia is a modest restaurant in the heart of Harehills I wasn’t expecting it to be expensive, and it was indeed cheap – with the shared platter and a couple of soft drinks coming to just £13.50 (update: the second time we visited in early June Abyssinia had printed menus, though the dish we had wasn’t listed on it, so you need to ask for it. We were also served more food the second time but the price for two with two soft drinks was more expensive at £18). I enjoyed my meal at Abyssinia. I would like to go back when there are more people there, though I’m not sure how busy the place ever gets, as the owner began shutting up as soon as we left at around 9.30 pm on a Friday evening. The food was fresh and interesting, and if you appreciate an authentic dining experience that’s a bit different to the norm, you’ll like Abyssinia a lot. Thank you for the review and for the information you provided on your blog. Abyssinia Bahlawi Megb Bet now got their own website with a menu of the different types of Vegan and Vegetarian food served in the restaurant. Also, there is reservation system in place now – as well as the website displays opening and closing time of the restaurant. Here is the link to the website: http://www.abyssinialeeds.co.uk Cheers. The Vegan Punk cool, many thanks. I will add a link to your blog once I implment a blog section on the website, if that is okay. Thanks, I’ve added the website and Facebook to the review.